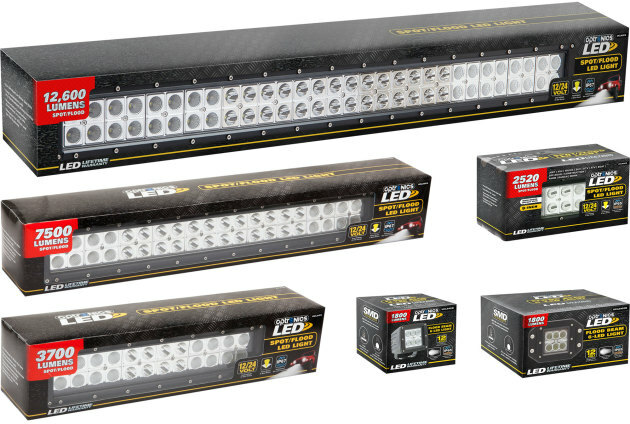 Optronics International has introduced five new LED light bars, adding to three versions already in the product lineup. The new lamps include a pair of three-inch cubes, a nine-inch bar, a 30-inch bar with supplemental turn functions, and a 52-inch bar with a 20,000-lumen beam. With the exception of the 30-inch multifunction lamp, all other light bars in the family combine spot beams and flood beams. The light bars were first introduced in 2017 and feature a lifetime warranty – replacing a full lamp if just a single diode fails. Each light bar carries an IP65 rating for dust and water resistance, too. Seven of the lamps feature die-cast aluminum housing and mounting brackets and come with stainless steel hardware, and the 30-inch lamp with its auxiliary turn function includes an adjustable stainless steel sliding bracket. Three of the new lamps are designed for both 12- and 24-volt electrical systems and the two three-inch cubes work exclusively with 12-volt systems. Four lamps are hardwired with 16-inch leads and the 30-inch lamp comes with 24-inch leads.